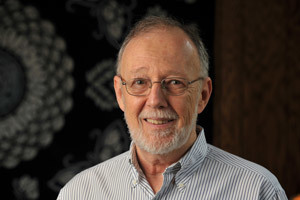 Howard Goldblatt, research professor in the Department of East Asian Languages and Cultures at the University of Notre Dame and the foremost translator of modern and contemporary Chinese literature in the West, has been awarded the 2009 Man Asian Literary Prize for his translation of “The Boat to Redemption” by Chinese author Su Tong. The book is about a disgraced party official forced to make a new life among the boat people resulting in revolutionary impulse. Sponsored by the Man Group, a London-based futures brokerage company, the Man Asian Literary Prize is designed to bring new Asian authors to the attention of the world literary community, facilitate publishing and translation of Asian literature into English, and highlight Asia’s developing role in world literature. A member of the Notre Dame faculty since 2002, Goldblatt also was awarded the inaugural 2007 Man Asian Literary Prize for his translation of “Wolf Totem” by Chinese author Jiang Rong. He is a recipient of two translation fellowships from the National Endowment for the Arts and has published English translations of more than 40 works by writers from China, Taiwan and Hong Kong. His translation of “Notes of a Desolate Man” by Taiwanese novelist Chu T’ien-wen won the 1999 Translation of the Year award by the American Translators Association. Goldblatt has contributed essays and articles for numerous publications, including the Washington Post, Los Angeles Times, Times of London and Time Magazine. He received an honorary doctorate last year from the Open University of Hong Kong. Originally published by Shannon Chapla at newsinfo.nd.edu on December 07, 2009.